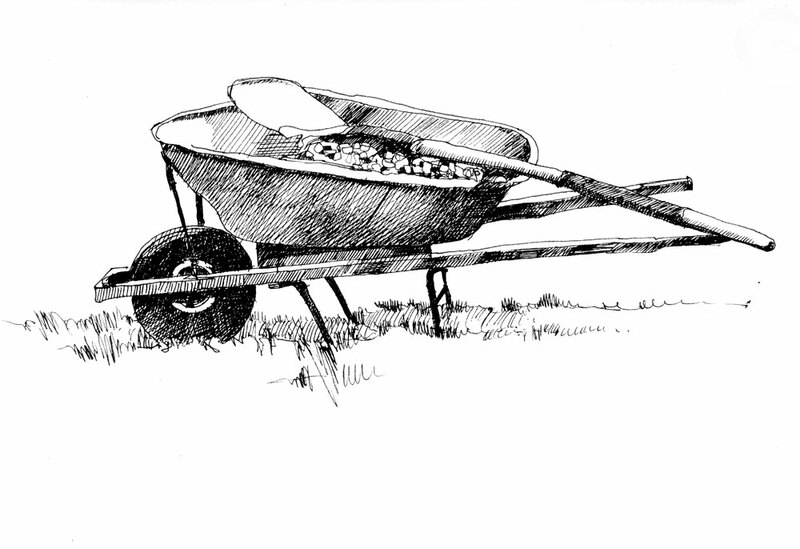 Is this the often painted wheelbarrow… the one that hasn’t moved for many months? I like the sketch… it has a lot of depth and the fine hatching is very effective. Is this larger than normal?… the detail seems to suggest that it is. This is one and the same! It has finally moved from its winter location and now is in use, as you can see. The drawing is in a book that is about 9 x 12 although I did crop it a bit. Is this done with the Lamy pen? I think that I am seeing the expressive linework, particularly in the grass. Yes, this was done with the Lamy pen. It works really well when I don’t want to add colour. Oh, the gardening. I have been doing too much sketching lately and not enough gardening. But tomorrow will be my gardening day. More inspiration? I have always loved Wm. Carlos Williams. Do you know this one? I know and love that one Joan. But I haven’t heard it in a long time so thank you for reminding me of its beauty. How wonderful to have these poems recalled. A few years ago a friend commissioned a painting based on This is Just to Say and I’ve always meant to paint one to go with The Red Wheelbarrow but have never gotten to it so thank you for reminding me of it today Shari! We have an Arctic freezehere this week after summer last week so I’m interested to see what next week will bring. Maybe some varnishing weather?